sinniehinnie on Why is the sky blue? Air Tutors on Why is the sky blue? So, the weather in Los Angeles finally changed from 84 and sunny to 79 and cloudy, which is drastic for LA. It’s funny how the city goes into disarray when there are some clouds in the sky and it’s interesting watching people’s mood fluctuate based upon sunlight exposure. But as I was walking around outside I thought about the sky’s color and what causes it as one of my students asked me the other day. The answer is preferential scattering of light. As white light enters the earth’s atmosphere it is broken down into its component parts, which is all of the colors of the rainbow. 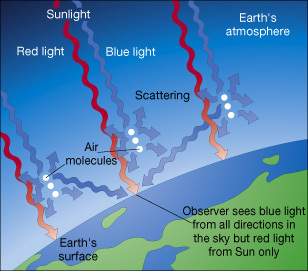 During the day then the blue light is “preferentially scattered,” or a better way to put it is that the blue light is chosen to be separated, and then this light becomes the background of the sky. Then as the sun changes position throughout the day it goes closer and closer to the horizon and when it does so the light that’s chosen to be separated changes and it usually culminates with a purple-y or pinkish color at sunset. Playing to everyone’s strength is great. We all learn different ways and it is my responsibility as a tutor/mentor to reveal those strengths to my students and from there have them indulge in it. Once they find strength they will then find courage and that’s all that’s needed to heighten their morale to get them to keep trying their best at school. Tutelage is a very intimate process. The act of revealing something you don’t know or are not good at can be very challenging for almost everyone. That’s why whenever a student gives me an answer for a question I give them I never say “No” to them. When I’m tutoring some times I run experiments on my students and see their reaction when I say “no.” They usually cower and retreat into their shell, which stabs the whole intimacy in the throat. Sorry for the graphic 🙂 But it’s true! And that is exactly why I never say no. I always use some other word/phrase: “you’re in the vicinity” “not close” “almost” etc… I value my students opening up to me and it always helps when I reveal my insecurities to them. Tutoring is fun if the tutor is fun. The last thing a kid wants is to have their teacher follow them home to teach them again! Tutors gotta be young, fun, upbeat, and engaging!